A 45m-high majestic monument located on 2/9 street. The monument was built by Danang people to cite heroes who fought for the independence of the country. 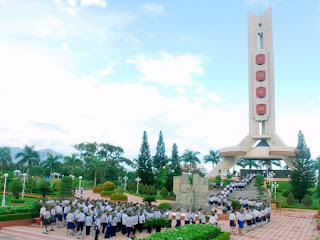 The heroes’ statues such as Pham Phu Thu, Hoang Dieu, Phan Chau Trinh, Nguyen Van Troi have been showed lively and made the monument more solemn. The area is very spacious and airy. In addition, the 29-3 square is in front of the monument; Han River is situated behind the monument make the sights around the monument more harmonious and charming. In the afternoon, Danang people often gather to enjoy the view and take the air. In the last days of the year, there are many kinds of ornamental plant, flower from all over the country are displayed in 29-3 square. The monument attracts many tourists come here to view the sightseeing and take photos.